The microstructure of various concrete mixtures is being tested and modeled in multiple scales by a team of UNL engineers that is led by Yong-Rak Kim, professor of civil engineering, and Joseph Turner, Robert W. Brightfelt professor of mechanical and materials engineering. A team of UNL engineers - (from left) Yong-Rak Kim, professor of civil engineering; doctoral students Mahdieh Khedmati, Charles Nguyen and Gabriel Nsengiyumva; and Joseph Turner, Robert W. Brightfelt professor of mechanical engineering - is working to find greener, cheaper and more durable concrete mixtures with alternative and recycled materials. With an eye on reducing costs and lessening the impact on the environment, more infrastructures are built with concrete made of alternative binding and recycled materials. With a recent grant from the National Science Foundation, engineers at the University of Nebraska-Lincoln aim to create better mixtures by understanding their performance and durability in certain stages of material fundamentals. Yong-Rak Kim, professor of civil engineering, said "Concrete is the world's most widely used material in construction, and the use of alternative binding agents and recycled materials is becoming more important every day." "The issues we are facing come back to finding ways to make a high quality, green material while keeping the cost of construction down," Kim said. "We know that the formulas traditionally used to make cement concrete create a good-quality product, but in the production of cement a lot of carbon dioxide is also created, and that can hurt the environment." This issue has led some to use non-cement binding materials and recycled materials as aggregates in construction materials. But, Kim said, "Not enough is known about the performance and durability of those materials that are blended." To better understand the process, Kim said, "It's important to get as small as possible." "It's much more important to start from small rather than large, especially when you are dealing with materials and structures understood less," Kim said. "At the micro or even nano level, you can see that there are small things, including microcracks, that are created from different reasons. Namely, a completely different world! We need to get to the smallest scale and link it to larger scales so we can design materials and structures with fundamental genomic understandings." Joseph Turner, Robert W. Brightfelt professor of mechanical and materials engineering, is leading the nanoscale examinations of "microcracks" created in the various mixtures. The danger for concrete structures, Turner said, is when those tiny fractures become big problems. "It's like the windshield of your car," Turner said. "Something can cause a very tiny crack that, by itself, isn't very significant. But when multiple tiny cracks begin to propagate and they come together into larger ones, you suddenly have a bigger failure that can be very costly." Nanoscale mapping of chemical and mechanical properties is the focus of Charles Nguyen, a doctoral student in Turner's group. Two of the doctoral students in Kim's Sustainable Infrastructure and Materials Research Group – Mahdieh Khedmati and Gabriel Nsengiyumva – are sharing the information they glean from working with different scale samples. Both say one material is showing promise as potential binding alternative. "Geopolymer and the standard ground rocks ... mingle well with each other," Khedmati said. "You can actually make a structure that is like a solid rock," Nsengiyumva said. "It's even stronger than traditional concrete." 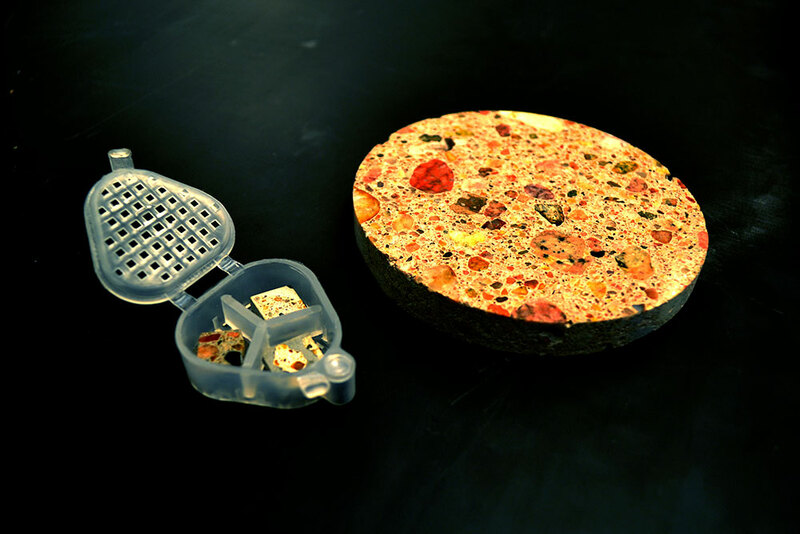 Kim and Turner are curious to see how geopolymers form different interphases with recycled aggregates and how they differ from the conventional cement concrete mixtures. "After microcracks initiate, they follow the path of lowest strength," Turner said. "The goal is to understand how to eliminate the weak regions of the material by strengthening our understanding of the interphase."